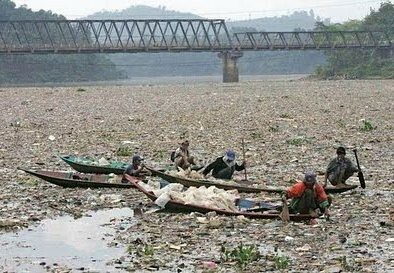 We are deeply saddened by the overflow of Citarum River that inundated the Southern Bandung and the City and Regency of Karawang a few weeks ago. 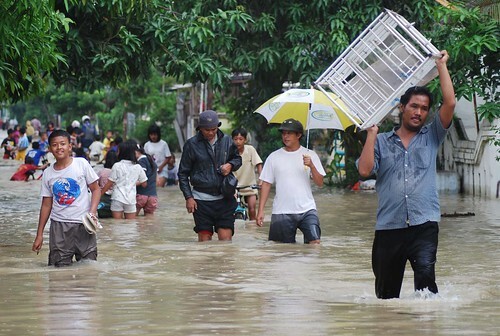 The material losses from the floods could reach trillions of rupiah due to the potential losses in various agricultural activities, wetlands, fishery, textile industry and power plants. Sungai Citarum Indonesia dianugerahkan Sungai Terbersih Di Dunia, originally uploaded by omaQ.org & Red Frame Memories. 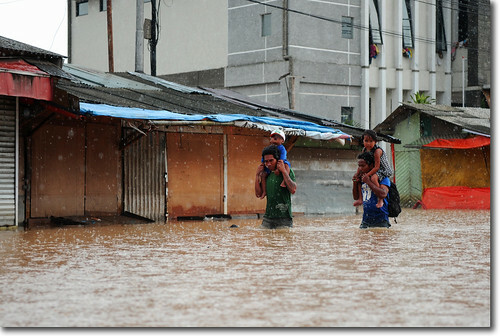 In the aftermath of Citarum floods, West Java Governor Ahmad Heryawan proposed to the central government a number of ways for preventing the recurrence of similar disasters in the future including the construction of 22 dams, the normalization of the Citarum River and its tributaries and the dredging 9 Citarum river. West Java Government also recommended the prohibition of deforestation, moratorium on conversion of water catchment areas, the control of river bank areas, and seasonal agricultural restrictions on the slopes more than 30 degrees. In the long run, the propasals from the Governor of West Java will not sustainable if they are not supported by sustainable urban planning that considers the ecological and environmental balance in the broader context. The conversion of water catchment areas and forests into agricultural areas is also a result of unsustainable urban planning. The Citarum river basin has an area of 718,268 hectares and covers eight cities and districts in the West Java Province including Bandung City, Bandung Regency, Cimahi City, Sumedang Regency, Cianjur Regency, Purwakarta Regency, Karawang Regency, and Bogor Regency. The eight cities and regencies are an area that experienced a high level of urbanization. High level of urbanization in the urban areas in the Citarum river basin is one of the factors that need to be strongly considered for preventing the occurence of Citarum flood in the future. Anakku, originally uploaded by enhaka92. The link between high levels of urbanization with the conversion of forest areas is explained by the land-use model initially proposed by Von Thunen and later developed by Ernest Burgess. This classical model explains how the market determines land use in many different locations. Based on this theory, agricultural areas or seasonal wetlands located on the outskirts of town and forest areas that have a cheaper land lease will be located farther from the city. This theory also explains the process of succession to land due to development of the urban area. Bandung City, Bandung Regency, Sumedang Regency and Cimahi City are included in the Bandung Metropolitan area which has a high level of urbanization. Meanwhile, the Regencies of Bogor, Cianjur, Karawang, and Purwakarta are the suburbs of Jakarta that have a high level of the conversion agricultural lands to urban areas. The high level of urbanization in Jakarta and Bandung Metropolitan megapolitan has resulted in the increased demand for urban land for accommodating population growth and the development of urban sectors such as industry and services. Without strict restrictions on the expansion of urban areas, the conversion of agricultural land into residential areas or industrial areas in the suburbs will continue to happen. The conversion of agricultural land in the suburbs will also have an impact on conversions that occur in water catchment areas and forests. Farmers who previously worked on his land on the outskirts of the city will look for his new farm to water catchment areas and forests. Such a process of land succession will continue in line with the urbanization rate, except where restrictions on the expansion of urban areas is applied. Many states in the United States have imposed restrictions on urban areas so as not to expand to agricultural areas or other environmentally sensitive areas. Policies such as growth management or urban containment has been proven to limit the growth of urban areas and protect agricultural and forest areas. Although this policy in the short term will impact negatively on the provision of affordable housing but in the long term this policy will be more sustainable. Evacuate , originally uploaded by Neng Dew. The pressures due to the high urbanization rate in urban areas in the Citarum river basin should be limited and should not interfere with the preservation of the upstream area of Citarum river basin. The development of urban areas in the Citarum river basin should be restricted and not allowed to convert agricultural land to urban areas. The preservation of agricultural land in the suburbs will indirectly reduce pressure on the forest conversion in the upstream area of Citarum river basin. In the long term, it will result in the environmental sustainability in the Citarum watershed and will prevent the floods from happening in the future.